1 loaf French bread, cut into 1-inch thick slices to cover bottom of 9 x 13 pan. Grease bottom of baking pan with butter or cooking spray. Fill baking pan with bread slices so that the bottom is completely covered. Mix eggs, milk, vanilla, cinnamon and nutmeg. Pour over bread slices, being sure to cover all the slices. Cover with foil and refrigerate overnight. Mix topping ingredients and let sit covered on counter overnight. Preheat oven to 350.° Remove bread from refrigerator and spread topping evenly over slices. Bake until puffed and golden brown, around 40 to 45 minutes. Let stand 5 minutes before serving. Makes 6 to 8 servings. 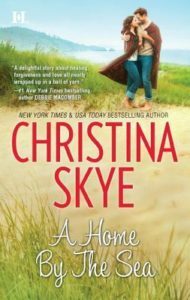 Read an excerpt from A HOME BY THE SEA here. Download A HOME BY THE SEA recipe card here.